When I reserved my tickets last Summer for a visit to The Broad, downtown L.A.'s new art destination, I had no idea my appointment would land on a rainy and grey afternoon, perfect for poking around an art museum all day. I'd been super jealous for months of all the posts and stories coming out about The Broad, and was so excited for it to finally be my turn. 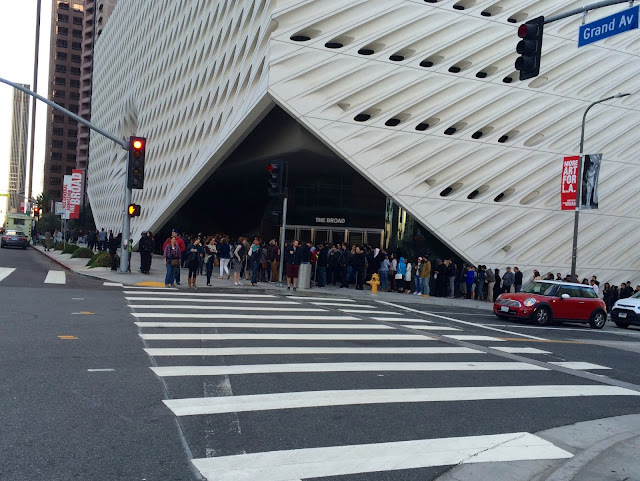 There is always a long line formed outside of the museum for people to try and get in without reservations, as reserved tickets are booked deep into 2016. 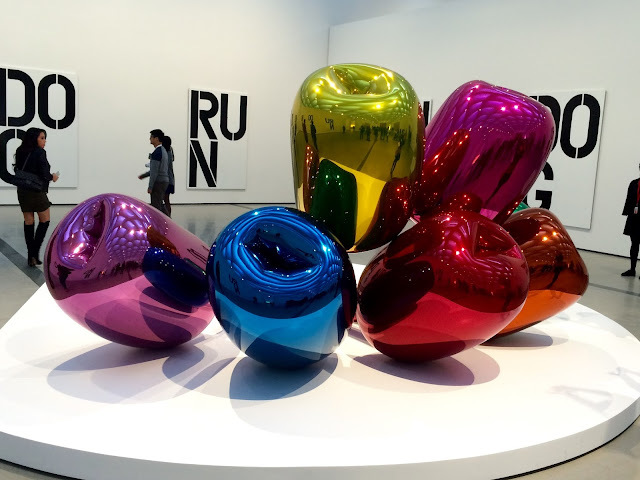 That line seemed to be moving pretty fast though, and I think I'd suggest that you go that route and just have fun in line, because my reserved tickets got me inside too late to sign up for the Yayoi Kusama Infinity Mirrored Room. Major bummer, because that looks like the coolest thing in the world. I tried bribing someone in line, but they held firm, so I'll go again and stand in line with you for that. 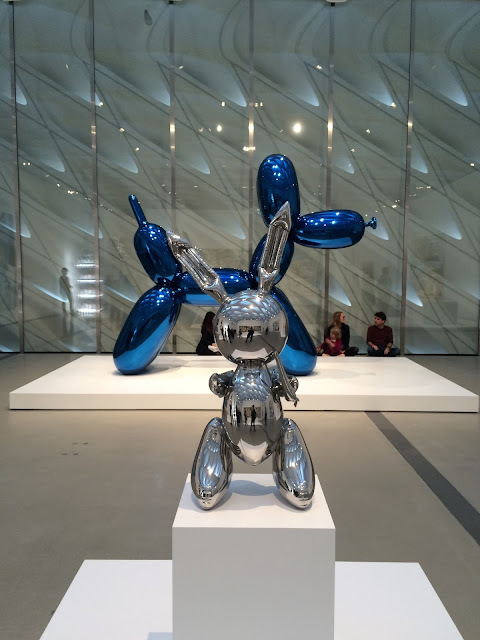 The Broad collection is so vast and impressive, but super fun and you really can see everything on display in an afternoon, so it's not all daunting, just easy breezy. 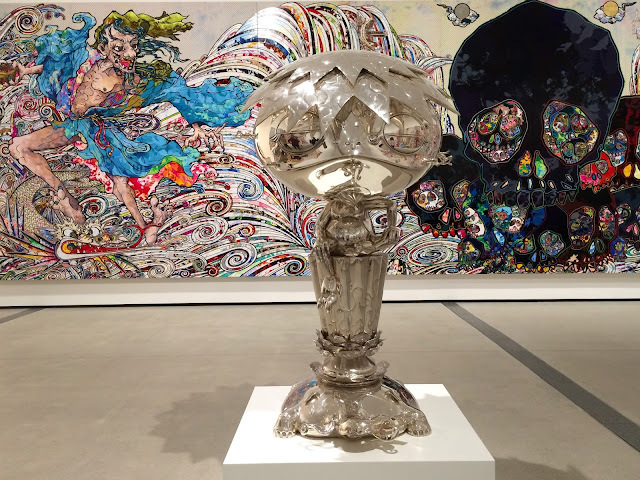 There are so many wonderful works, that I'll show you a whole bunch of my highlights, and there will still be a whole bunch of surprises for you to see when you go. Because you must. The Broads focus on postwar and contemporary pieces, the art of their time, so most of the work on display is done by current working artists, which gives it all a very fresh and now feeling. 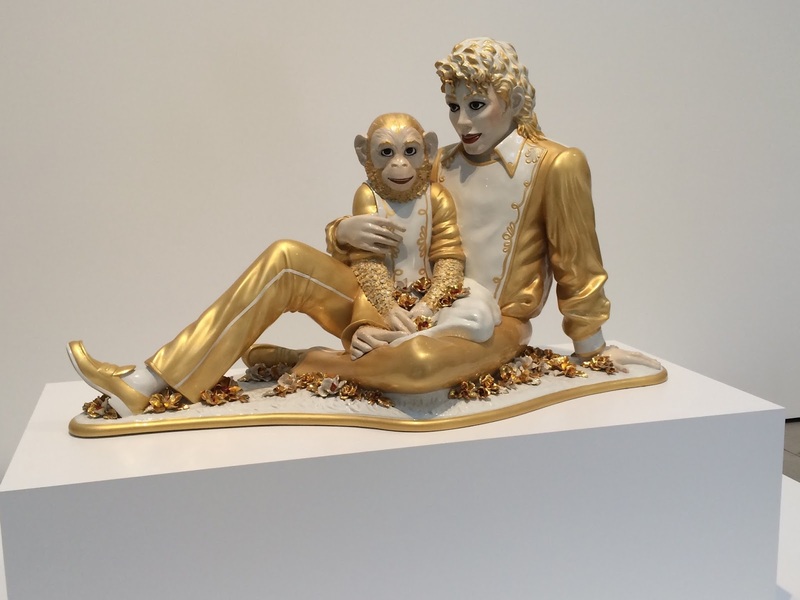 Once we gave up on the Infinity Room, we relaxed and thoroughly enjoyed absolutely everything we saw ... even the creepy Michael Jackson and Bubbles by Jeff Koons. 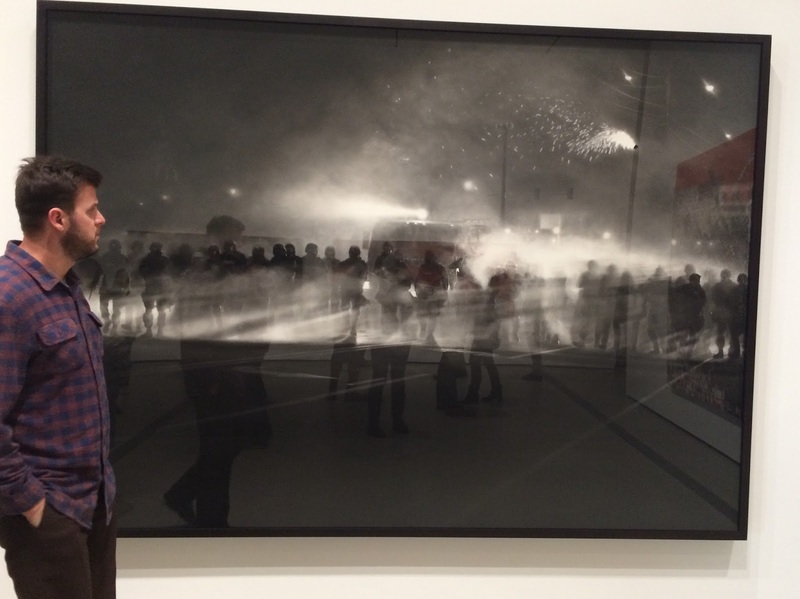 The collection is so modern that the first big piece I saw was a large scale photograph by Robert Longo Untitled (Ferguson Police, August 13, 2014) of the turmoil in Ferguson, MO last year. 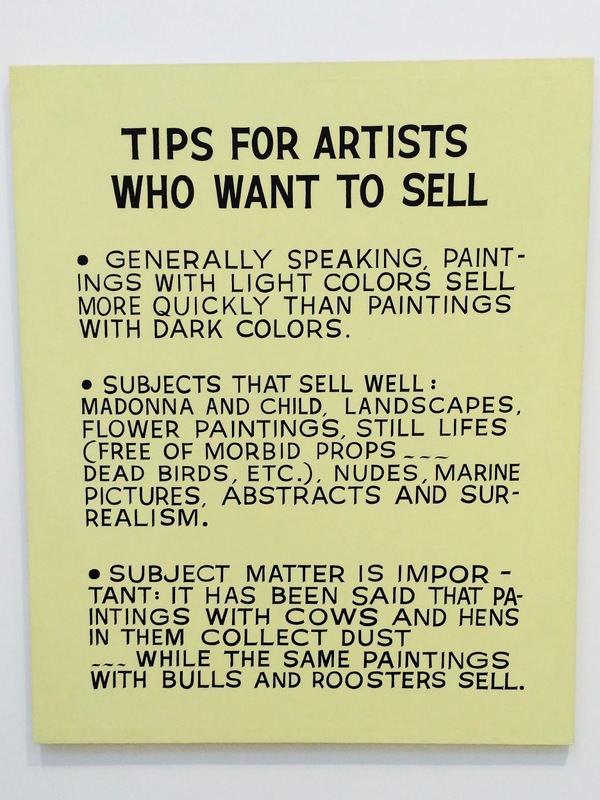 Very timely. 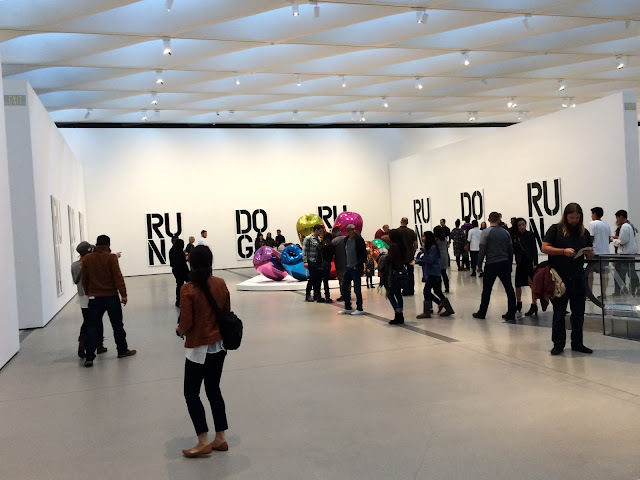 I like how The Broad is set up, with at times whole rooms dedicated to a single artist. 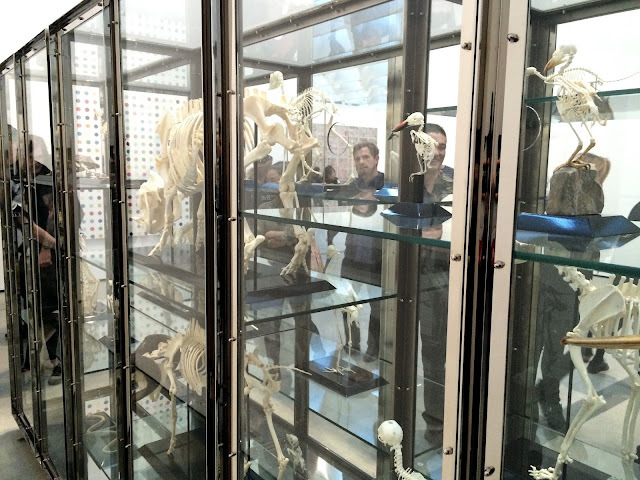 It's nice to see all one person in a room, as I think it helps you to better understand their deal. 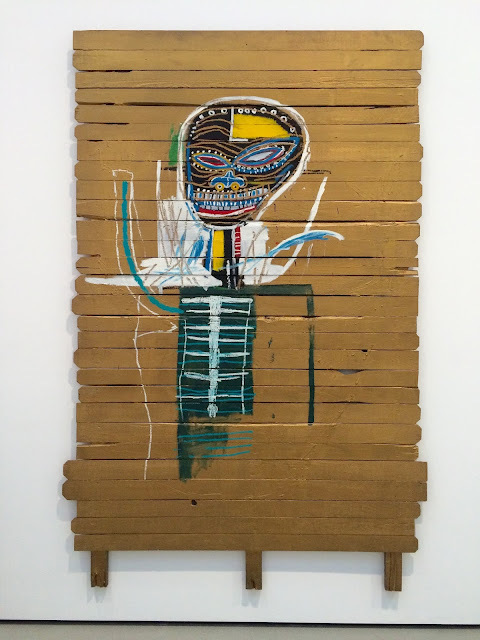 When artists share a room, they're contemporaries of each other, and the works fit together well. 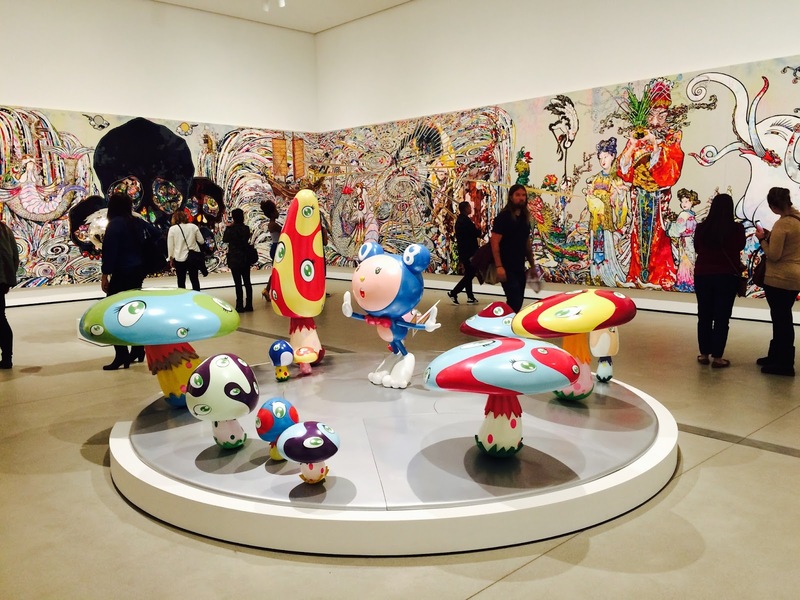 As usual, one of the most fun rooms was the one all done up for Takashi Murakami. His sculptures and large scale painting (In The Land of the Dead, Stepping on the Tail of a Rainbow, 2014) dominated an entire space, and was a favorite for art fans of all ages. A couple stopped to take in the chilly mountains of Japan in a great oil that I forgot to write down the artist of, but I loved it. 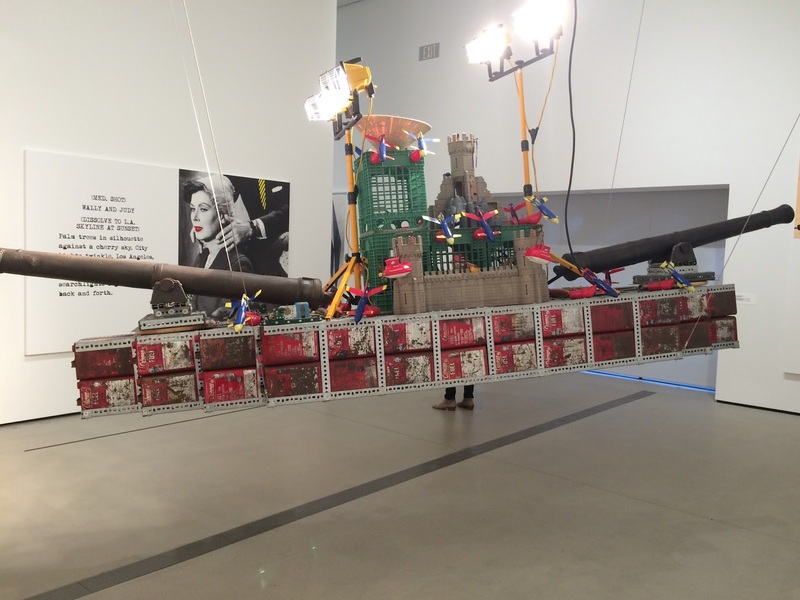 Everything is displayed in an interesting and accessible way, allowing the viewer to immerse themselves in the art, observing it from all angles in many cases, like Bateau de Guerre, 2001 by Chris Burden. Though we didn't make it inside the Infinity Room (can you tell I'm obsessed? 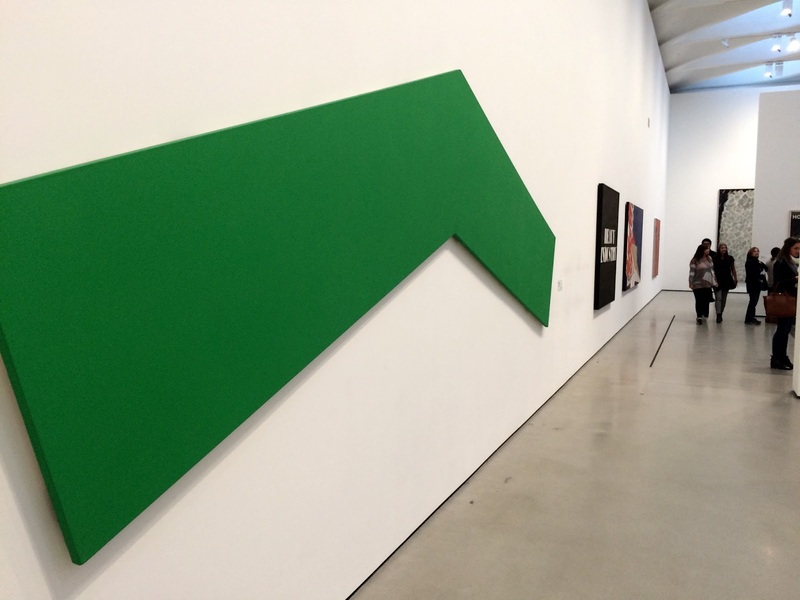 ), there were still plenty of things that invited interaction between the visitor and the work. 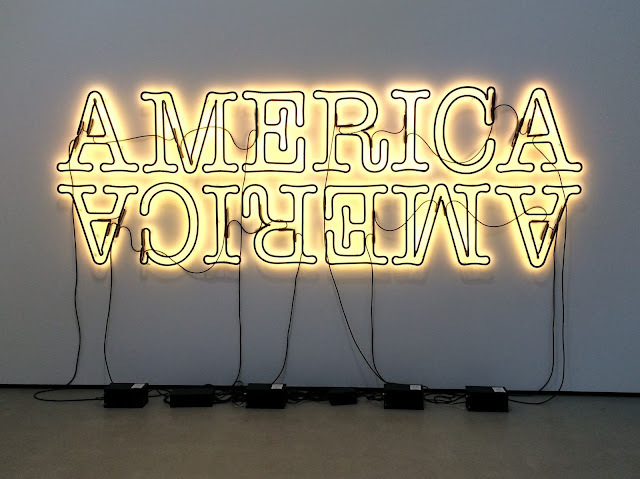 There is a cool installation of nine screens by Icelandic artist, Ragnar Kjartansson, called The Visitors, 2012. You enter a dark room and watch a song being sung by a different musician on each screen, playing the same song. It's cool because you're all in there together, but what you feel or how you view it is entirely your own. You come and go as you please, as the video runs for over an hour, ending with an explosion. One kid in the dark just said, "That was weird," making everyone laugh with his succinct criticism. 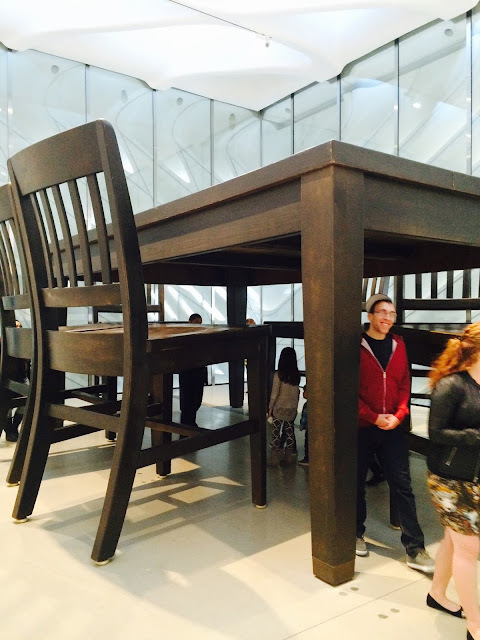 Another immersive piece was Under The Table, 1994 by Robert Therrien. You walk around under the giant table and chairs, transported back to when you were little, hiding out under the table. 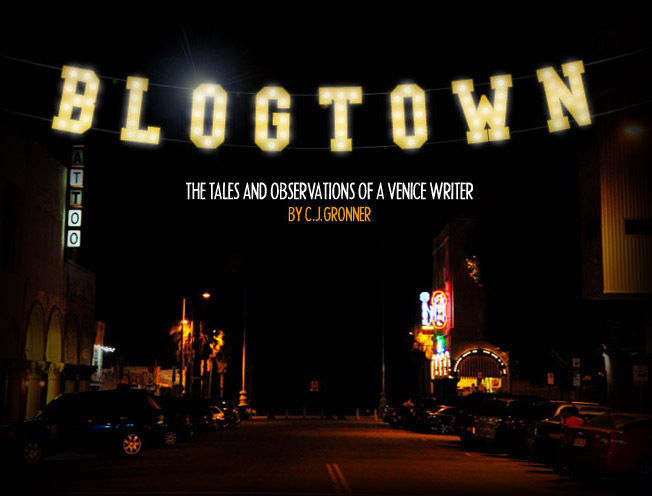 People loved it. There were a lot of pieces by John Baldessari, representing Venice downtown. I love everything he does, so was delighted to get to see a good many pieces by him. I loved a piece by Goshka Macuga, Death Of Marxism, Women Of All Lands Unite, 2013. The large tapestry depicts women visiting the grave of Karl Marx, extending on to the floor with grass and clothes strewn before it. 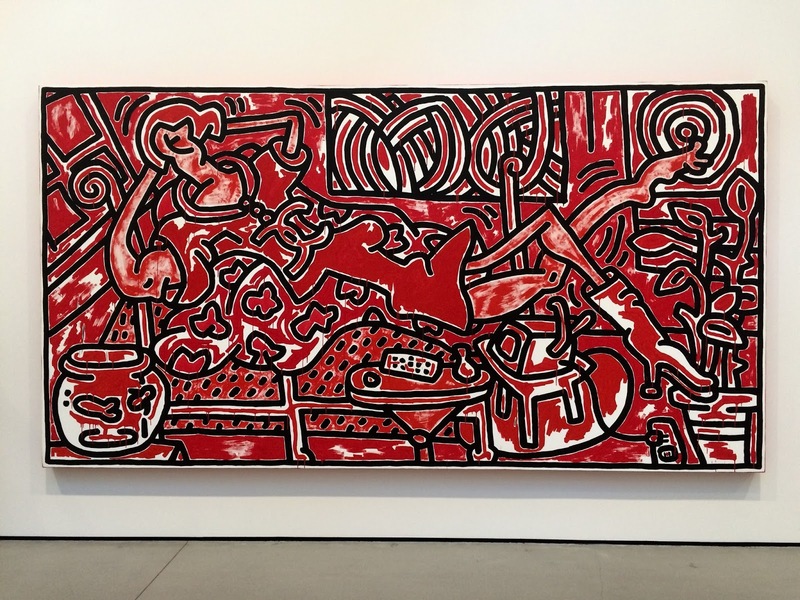 Macuga is a Polish artist, and her tapestry was one of my top highlights of the entire collection. 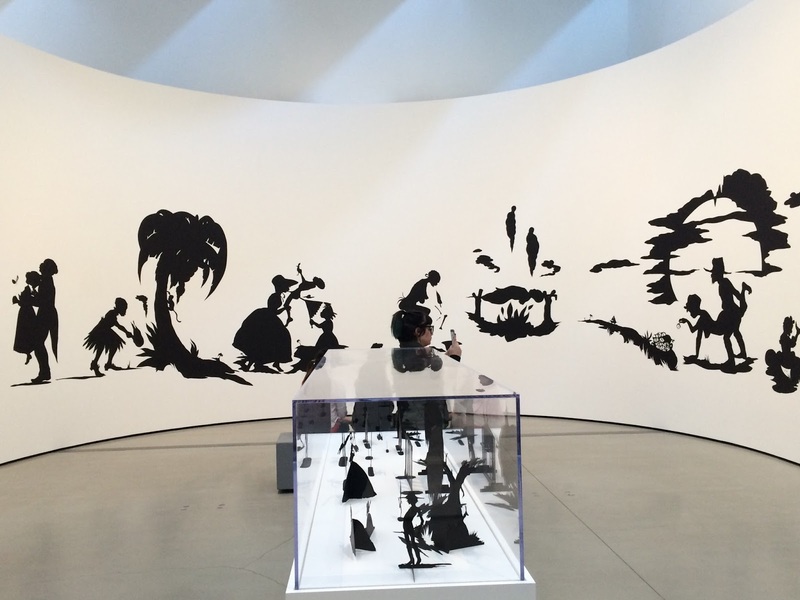 My top TOP highlight was the room belonging to Kara Walker. Walker is one of my all time favorites. Her Burning African Village Play Set with Big House and Lynching, 2006 is really something to behold, with its examination of slavery in America, poignant and beautiful all at once. Jeff Koons is well represented, with his Balloon Dog (Blue) and Tulips joining MJ and Bubbles. 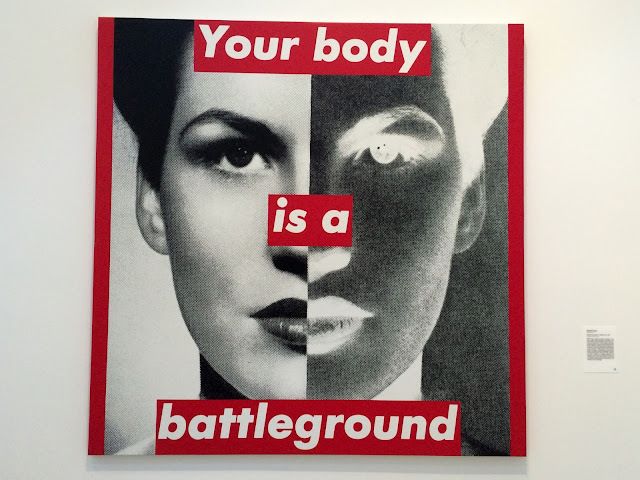 Barbara Kruger is here with Untitled (your body is a battleground), 1989, which can also be yours in T-shirt form down at The Broad's gift shop. 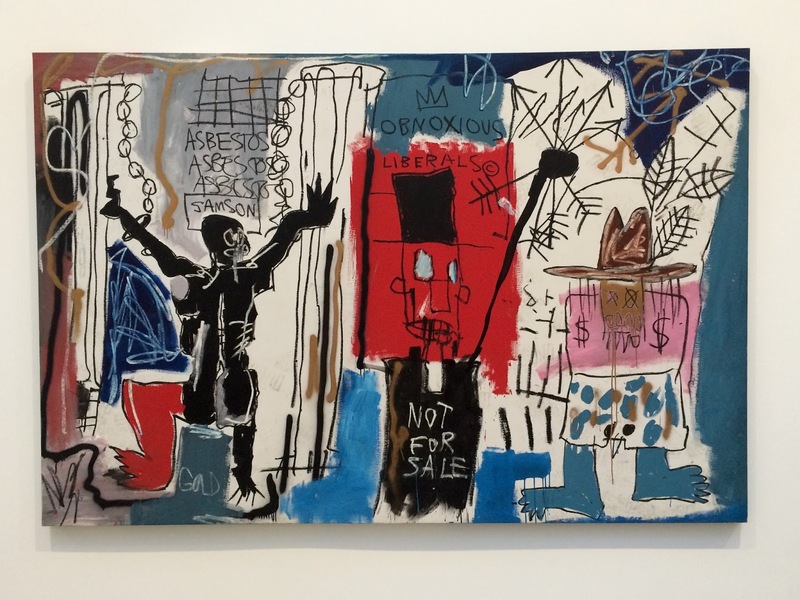 Another real highlight was the room dedicated to Jean Michel Basquiat and Keith Haring. Everyone loves both of them, and so much merchandising has been done over the years, especially with Haring, that it's great to see the originals in their true and mind blowing form. Basquiat, Haring, and Warhol are also very well represented in the gift shop, as you would expect, and both my brother and I left there with our own Basquiat skateboard decks for our walls. Had to. Here is his great Obnoxious Liberals, 1982. This is the original of my brother's deck, Gold Griot, 1984, and it is awesome. Chilling in the middle of the Basquiat/Haring room is a sculpture by John Ahearn called Raymond and Toby, 1989. 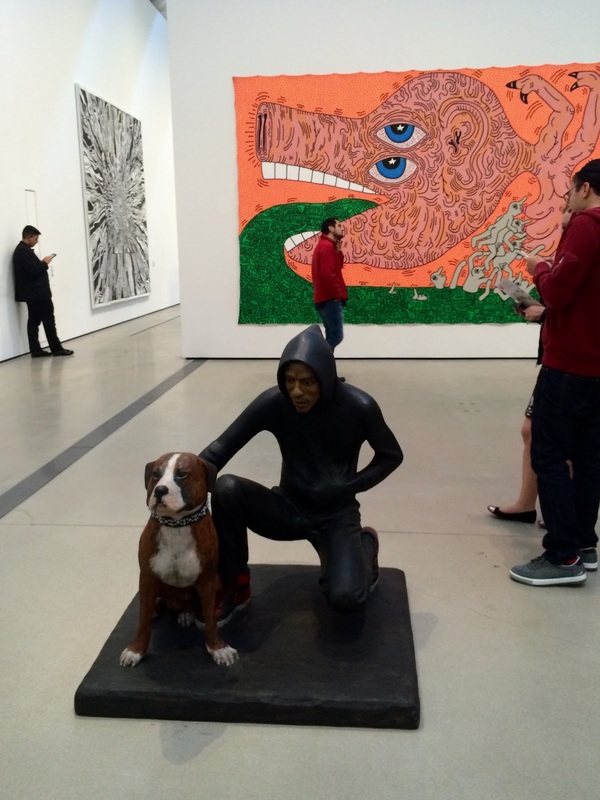 A guy and his dog sit in the middle of the room, seeming to be checking out the art along with you, very realistically. 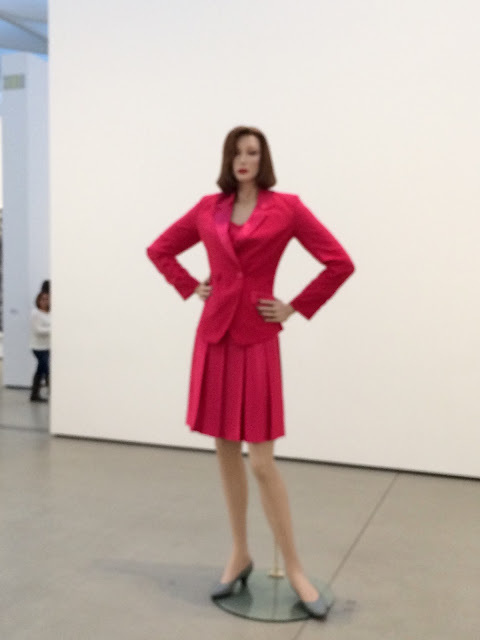 Another realistic - aside from the fact that she's 8 feet tall - sculpture is Fall '91 by Charles Ray. A woman in her pink early '90s power suit towers above you, making her both comical and kind of intimidating. 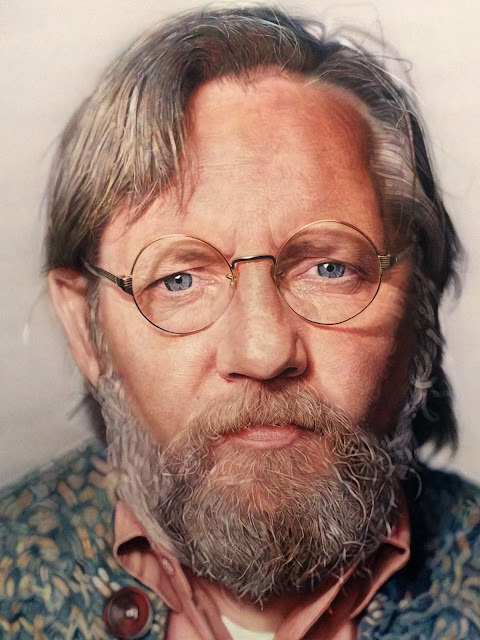 At the end of one hallway, you'll see a wall dominated by a Chuck Close oil painting. 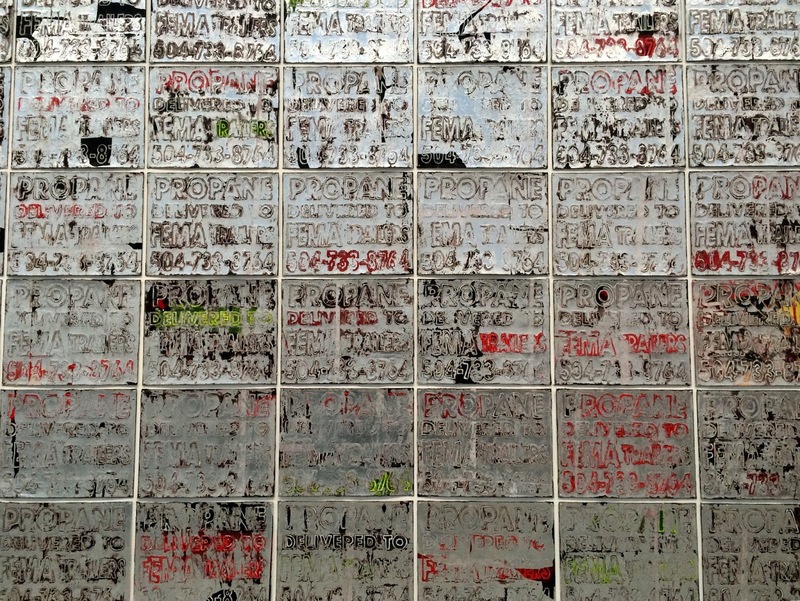 When you see the sheer detail involved up close with your own eyes, it's still hard to believe it's not a photograph. When you compare that level of talent and intricacy to the various blank canvases with like one slash of color on it, or paintings of soup cans or fish tanks holding basketballs (not naming any names), it's hard not to compare and question that age-old question, What Is Art? 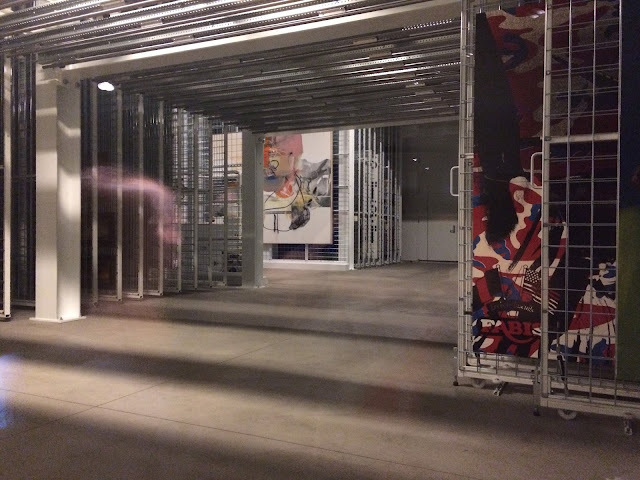 When you take the stairs from level to level, you get a glimpse of The Broad's vast collection as it sits in storage through little windows carved into the stairway. It's pretty cool. 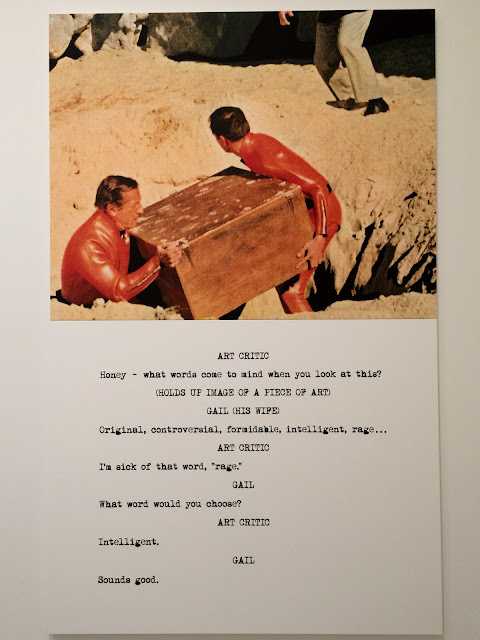 Art world darling Damien Hirst is here with his Something Solid Beneath The Surface Of All Creatures Great and Small, 2001. The animal skeletons and metal are cool and I get it, but I'd have rather seen his butterfly mosaics again, but that's just me. 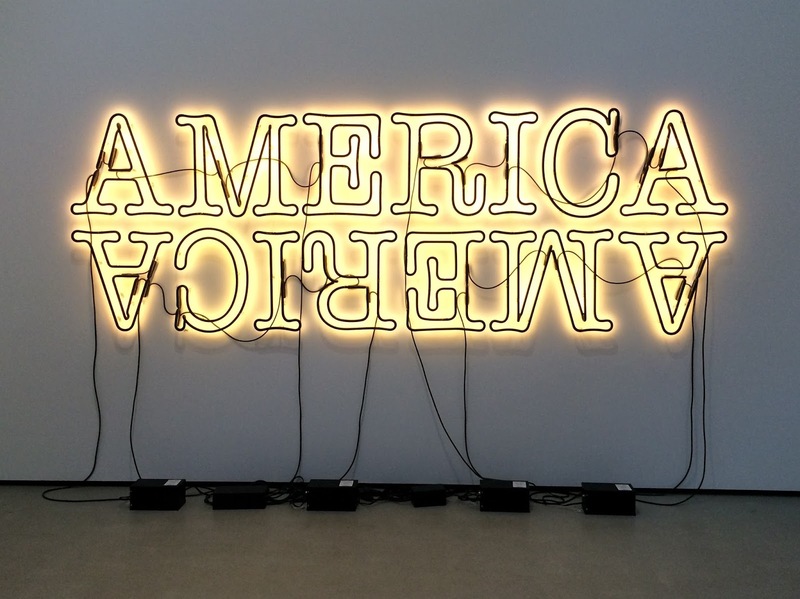 I really liked Double America 2, 2014 by Glenn Ligon all lit up, because .... America. 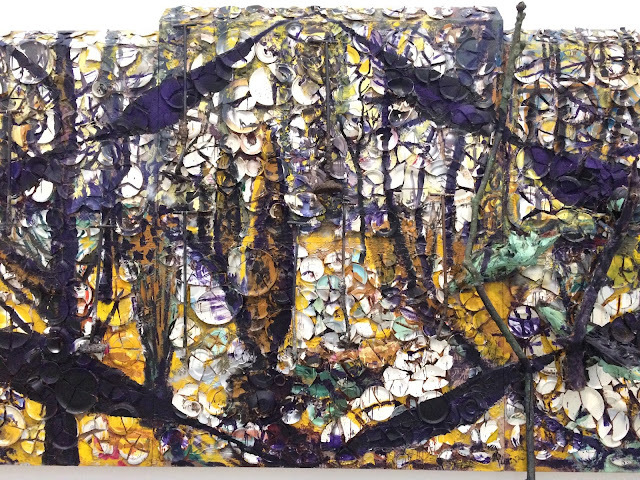 There is one of Julian Schnabel's plate paintings taking up a big wall, The Walk Home, 1985, combining painting and sculpture all in one across six big panels. It's real impressive. 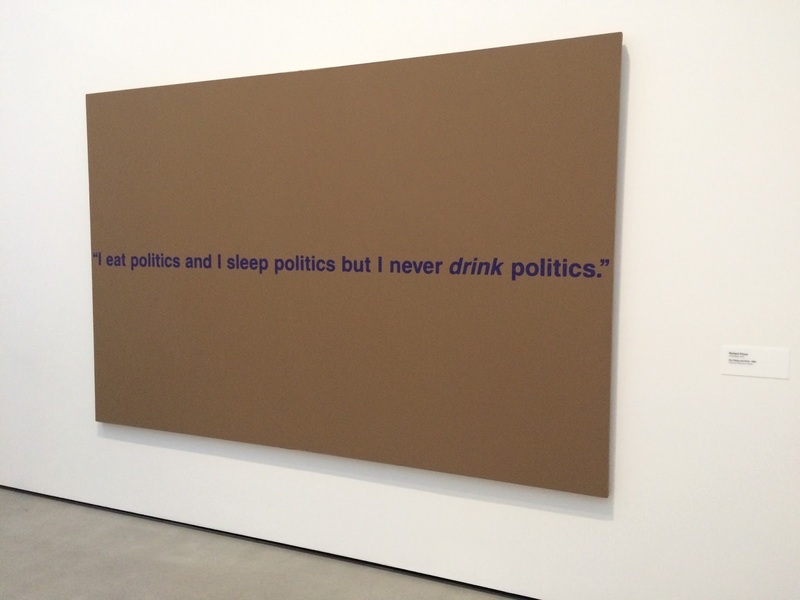 Richard Prince has a good one in there entitled, Eat, Sleep and Drink, 1989. Oh, politics. Never drink them. 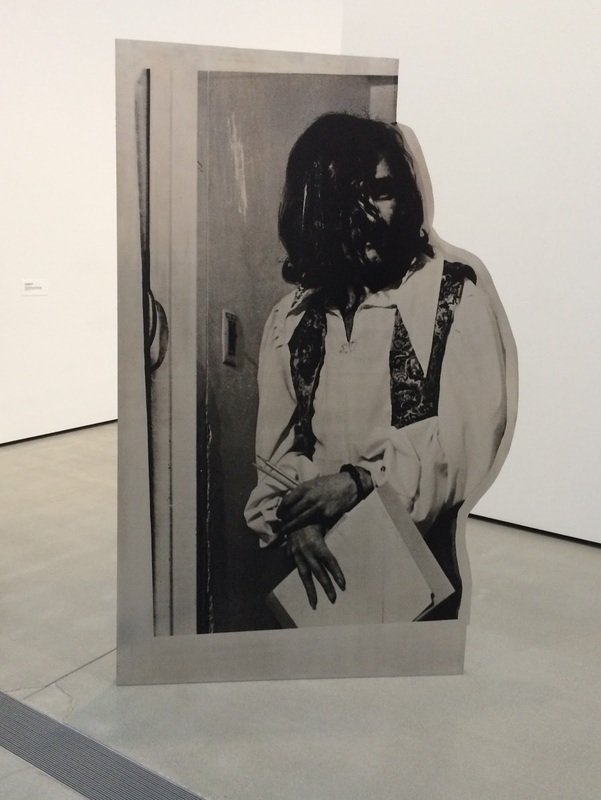 Another interesting piece that can be viewed from all angles is the silkscreen on aluminum cut out of Charles Manson by Cady Noland, Mr. Sir, 1993. Creepy. 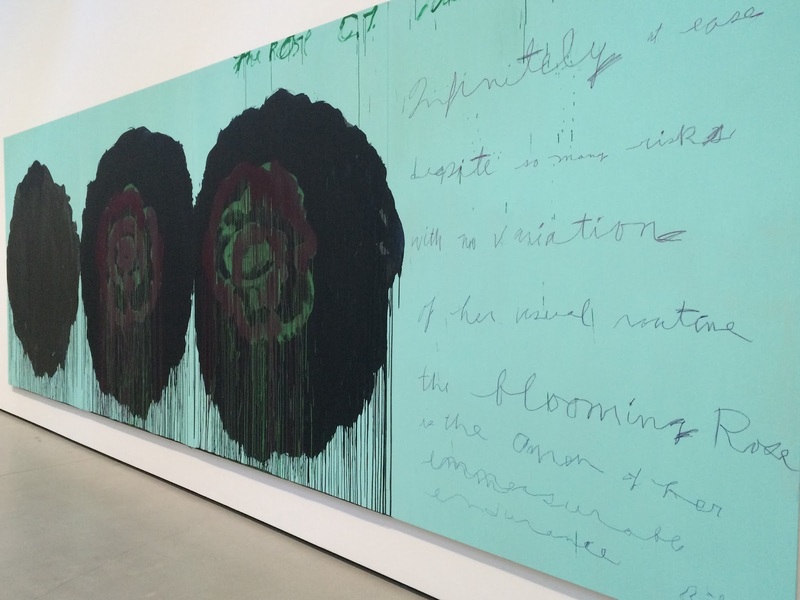 One big wall is taken up by Cy Twombly's The Rose (V), 2008. It is beautiful. 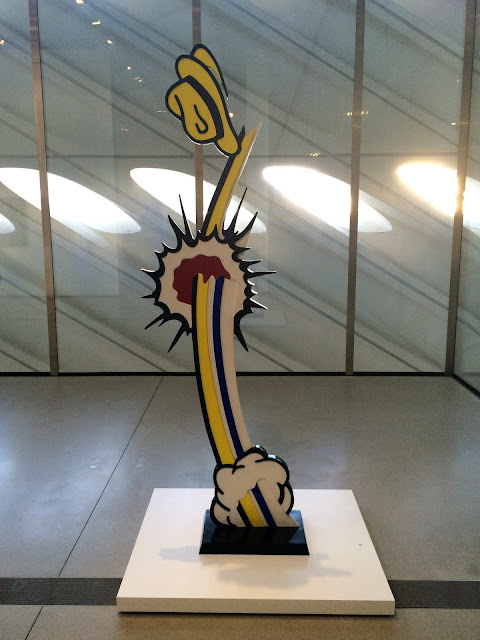 Roy Lichtenstein has a strong presence in The Broad, all whimsical and poppy. 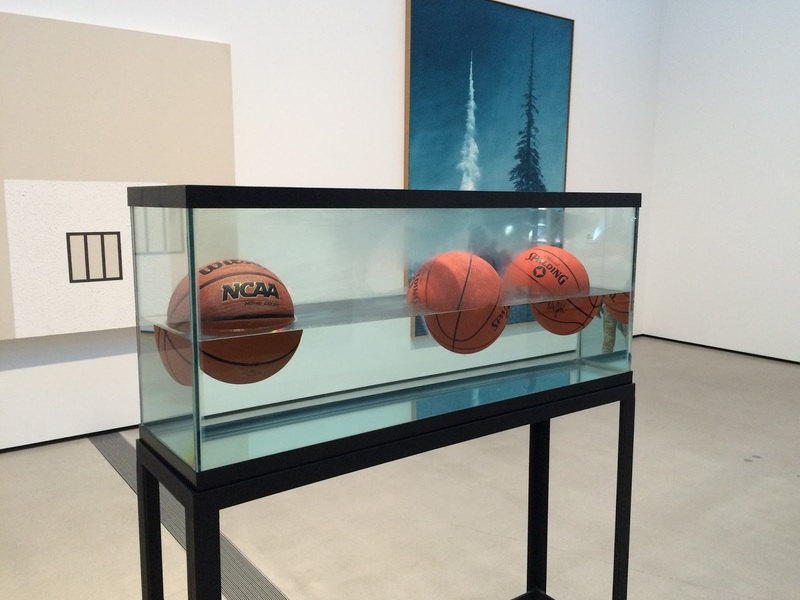 The late afternoon sun began to angle in to the gallery room with his stuff, and it all looked so great. The last big piece we saw before heading back downstairs to get our decks was Corner of Desire and Piety, 2008, a large mixed media collage with text and images provoked by the aftermath of Katrina in New Orleans. It's big and powerful and necessary and what I love about art. 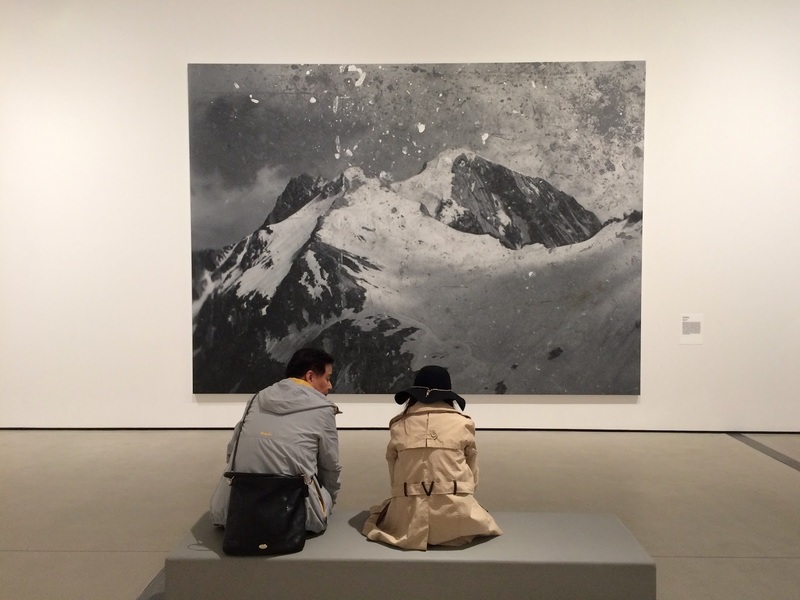 The thought provoking, the inspiration, and the emotions that capture our shared human experience. 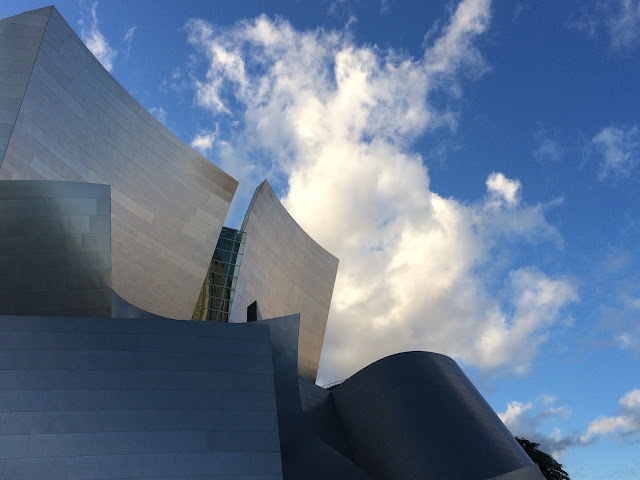 After all this art, we needed a repast and headed over to Kendall's for a martini and some cloud watching over Disney Hall. The Broad is so great, and a most welcome addition to the already ultra-vibrant Los Angeles art scene. I can't think of a better way to spend a day that isn't a beach day.